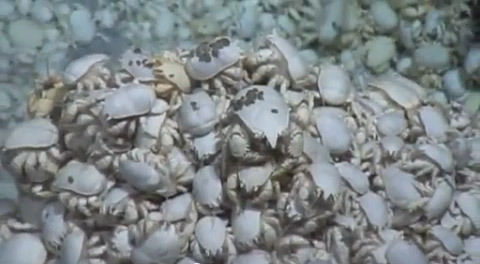 These strange little crabs range in size from 15 cm to under half a cm across. The little hairs that give them their name are very useful as they eat the little microbes that grow on them. They are also called the Hoff crab, after the actor David Hasselhoff who has a very hairy chest. They live 2,600 metres below the surface of the water near very hot hydrothermal vents in the freezing cold water of the Antarctic, so they have to be very careful not to boil or freeze. This means that they squeeze into a very small area, with up to 4,000 of these guys piled up in an area of just one square metre. At breeding time, the females have to go to colder water to lay their eggs, and they die soon after due to the extreme conditions. Hairy-chested yeti crabs were only discovered in 2010 by scientists using a remote operated deep sea probe. Are there any other interesting facts that you would like to share about hairy-chested yeti crabs? Yes, in fact there is something that you could add about the yeti crab. It can also be called a Yeti Lobster. Don’t know why, but it’s true! It was actually discovered in 2005.